Reality is that everyone has busy lives. At the time I started hitting the gym, I was a single Mom of two boys then 13 and 5. They have two different dads, which means two different schedules and a lot of the time two different and just as stressful headaches. I was working about 45 minutes each way from home to my job where I generally put in 40+ hour weeks. I was also running a home based business doing hair extensions out of my house, needless to say, I had gotten into the habit of eating what was easy instead of what was healthy. I would make huge batches of Sheppard’s pie and lasagna. While they are delicious, I cannot eat like that every day, I was also surviving on no less than 4 XL Tim Horton’s Double-Double Coffee’s (that’s more than 120 grams of sugar just from coffee). I have never been lazy. I really was busy. I would get up early to make breakfasts and lunches, to make sure kids teeth got brushed, and that homework was organized and in line. I would also be responding to emails and text messages from work, trying to stay in touch with my family out of town and driving kids to soccer, hockey, school stuff etc. I have never been much of a TV Person, but I certainly liked sitting down at the end of the day with some quiet music and a glass of wine. The moment that I decided I had enough everything changed. I gave myself one hour! “My” one hour when I started was always right after work. Boo liked the gym daycare because there were always lot of other little boys to play with so right after work I would pick him up from regular daycare and go to the gym. He’d play, I’d sweat… or lie on the matt hoping the fact I couldn’t move anymore appeared to be stretching. I gave up Tim Horton’s cold turkey, gave up most of my red wine. I would still have a glass with friends, and I still do, it’s just not every night. I switched out white potatoes for mashed cauliflower, quinoa for rice and started learning to use spices instead of sauces and creams. That’s it. 1 hour every day and I was down 30lbs in 45 days. I also started drinking water, water and more water. I felt amazing! Going home for Christmas that year I shocked everyone by how well I was doing. So let me help you give up your excuse. How much television do you watch on average in a day / week? Personally I usually have one series per season that I enjoy. Winter time is Game of Thrones, summer its True Blood, fall-ish is mad men. Yes the TV is on at my house, I have kids and a bf. They watch annoying kid stuff and annoying loud car stuff. But if you’re watching even an hour a day you just found your time to work out. Set the alarm for an hour earlier. When you’re overweight and tired, the idea of getting up early and losing an hour of sleep is horrifying. Trust me I remember it vividly. Hitting snooze like 6 times so that suddenly everybody is running late, nobody has what they need and you inadvertently go to work in mis-matched heels. Thing is the more you work out and get fit, the more energy you have… seems backwards but it’s true. Exercise releases oxygen into your body, more oxygen makes you feel more energetic. Then add in that it releases endorphins and they make you “feel good”. So now you’re working towards “looking good” and you already feel good. No caffeine or sugar crash required. Most of us work long stressful days and there’s nothing like taking even 30 minutes on your lunch to sweat out the frustration of a long day of frustrating “work”. Do this in front of the TV if you really cannot miss your “show”, do it in the morning, in the evening while making dinner whatever works for you. Body weight is a great thing, use it. Squats, lunges, jump squats, crunches, planks etc. Even better grab some weights, a kettlebell, and a resistance band and you can work out wherever and whenever you like. All I have to say to this is cut the crap! Yes perhaps eating “healthier” options from your favorite overpriced burger joint is more expensive. But a can of Tuna generally can be found around a dollar, eggs are dirt cheap, and spinach can be bought pre-washed for like $3 for enough to eat a salad a day for a week plus throw some in just about everything else you cook. I either cook everything all at once on a Sunday and pack my fridge with Tupperware. Never takes an hour to do all the cooking for a week. Most days I cook in the morning for the day. After the gym and while getting myself and my kids ready for the day. 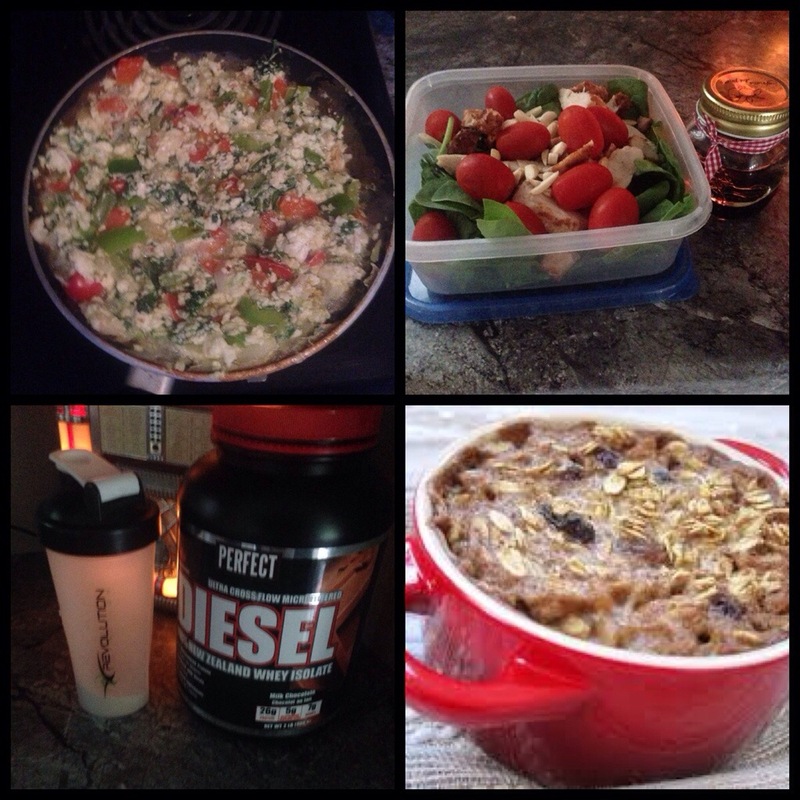 Meal 1 is usually oats, meal 2 and 4 Egg whites, salsa and spinach tossed and scrambled in the frying pan takes about 2 minutes to make, spinach salad with chicken and almonds and cherry tomatoes for lunch, and grilled fish and veggies for dinner and depending on my prep half a sweet potato. Add in a handful of almonds or some protein powder or veggies to crunch on and you just prepped all of your food for the day in 15 minutes. Easy Peasy! Nice to meet you. I’m Kelly and no, you’re not. Genetics definitely plays a role in body type, shape and size. However I’ll guarantee you’re bones are not three times bigger than anyone else’s. I personally think that these excuses have far more to do with how you were raised, or are you’re raising your own children. If you only ever were raised to eat meat and potatoes, chips and always had ice cream I guess I can see why you might feel deprived. It’s definitely a learned habit. However they say doing something for 12 days makes it a habit. So, set you’re self-up for success by making a 12 day plan and do not deviate from it at all. Bet you will look and feel amazing. From the ladies this is usually “I just want to get toned”. When they ask what I do at the gym and I tell them I lift as heavy as I can their next response is usually “But I don’t want to get bulky”… Ummm… so you want to look like me, and I just told you what I do, I am by no means a big girl (at all) so…. ? Of course you are not supposed to start any exercise program without first consulting a physician. However I have yet to hear of a physician saying no to working out due to any malady out there. Medications can work against you, however they will not stop you from working out. As for injuries, start light with any injured body part and work up slowly to full strength. Personally I was plagued by a bad back due to a car accident in my teens that used to “go out” randomly all of the time. I started doing no weight back extensions at the gym 2.5 years ago and it has’nt hurt me since. Also remember to submit your story for a chance to win a One Fit Mama or One Fit Papa T-Shirt. This is motivating a very motivating post! It is so true, we can get so caught up with the day to day grind of life that we often think it’s too hard to make our health and nutrition a priority. Even if it seems like an effort it is definitely worth it.